In February 2015 Mark Brefitt (Sharky to anyone who knows him) suffered a career ending double leg fracture whilst playing football for Warminster Town FC. Mark was Airlifted to the Royal United Hospital in Bath and had emergency surgery to insert an interior rod through his tibia and save his leg..
A day later massive swelling and pain had developed around the gastrocnemius and tibialis anterior. With the pain getting worse Mark was told it was compartment syndrome. They had to act quickly to halt the compartment syndrome… This was spilt into 2 operations , to open the one side of the muscle then the next day to do the other. Due to the severity of it they didn’t know how bad it was until they opened up the compartments , if too many cells were dead then a amputation may be needed. All was a success leading to 2 more operations to close the compartments. Mark left hospital 14 days later prescribed with lots of physio rest and recovery and was told that his walking could be effected for the foreseeable future and their was zero chance of playing football again. 2. Build a nerve graft to bridge together the tibial nerve which was snapped during the initial injury. Both operations were a success and 9 months later the Tibia and fibula had binded back together.. Their were complications with the rod through the tibia being pinned so high and another operation was needed to take a screw out and lower the rod which gave the tibia the ability to touch and bond together. 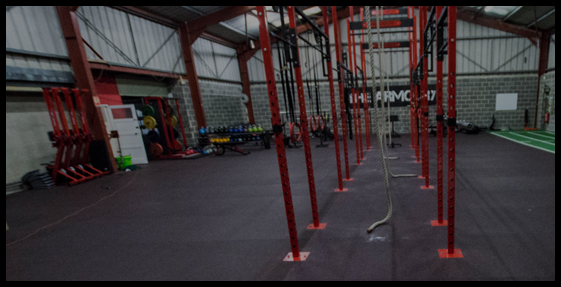 Mark started at the Armoury a little over a year ago weighing 16 stone 6 lb’s. He began joining in with the Warminster Town football teams sessions who he was managing at the time. His leg certainly restricted him in the beginning with certain movements but we were always able to scale the movements and his perseverance started to pay off… his leg was getting stronger, the weight was dropping off, his fitness was improving at a dramatic rate and he was becoming more familiar with all the exercises we were performing. The timed workouts, CrossFit metcons and group sessions suited his competitive nature and lit a fire within him. It opened his eyes that the gym and fitness in general can be an enjoyable sport not just a means to an end. It can be competitive and as rewarding as any sport and is so far removed from the normal hum drum setting of a commercial gym. We’ve seen incredible physical changes, and his fitness levels have improved beyond our expectations due to his relentless work ethic and determination not to allow the injury to stop him fulfilling his fitness goals. He weighs 13 stone 2 lbs that’s a weight loss of 3 1/2 stone! The rehabilitation was complete when just before Christmas he defied the experts and odds returning to playing competitive football for Warminster…. fitter, stronger and leaner than he’s ever been. 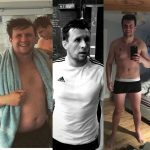 Mark has done all this whilst tackling a heartbreaking loss in his personal life and If his story doesn’t inspire you to get fit and get active then I don’t know what will! He serves as an inspiration to all those that know him and we’re proud he’s a member of our Gym. We’re looking forward to tracking his progress and helping him with his fitness goals in 2018. We’ve got zero doubts he’ll achieve them all!